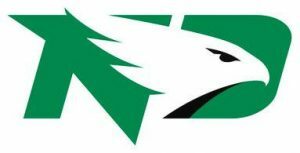 In 2012 the University of North Dakota, under pressure from the NCAA, agreed to stop using the name “Fighting Sioux” for its hockey team. Last fall the university finally settled on a new name for the team, the “Fighting Hawks”. Not everyone who shopped Saturday at the bookstore was impressed with the logo. Sandy Flaten of Park River, N.D., wore a Fighting Sioux shirt as she browsed through the store. When asked what she thought of the merchandise, she said she like everything except the logo.